Doing the homework on Thailand - you'll find a range of media outlets to keep informed. Thailand is a country with a large population (over 63 million). Just now the country is going through a political crisis in the aftermath of the coup in 2006. Despite successful elections in December 2007, the country has experienced street riots as two rival factions fight for supremacy. Thailand has always been a hotbed of political debate. It is a nation state with its own agenda. Healthy and vibrant news coverage is provided on a range of media outlets such as English speaking newspapers and a growing range of internet sites. There has been an explosion of web sites catering for regular visitors to Thailand. Many of these sites offer well written and often humorous insights into the lifestyle enjoyed by ex-pats and 'farang' visitors to the country. Thailand has two very impressive English language newspapers which offer the reader a combination of international and local news Bangkok Post and The Nation. These award winning newspapers are part of a Thai press that is quite active and free by Asian standards in spite of the recent coup and press restrictions imposed afterwards. 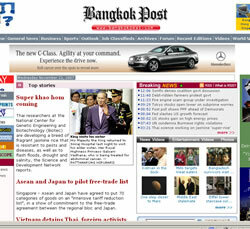 These newspapers have a comprehensive home delivery service in Bangkok and other regional centres. The Bangkok Post was founded by an American in the 1940's while The Nation was established in the 1970s. These newspapers are a good place to start for new visitors to Thailand to get a feel for what is going on in Thailand and the issues of the day. They both have strong online offerings for members outside of Thailand. Thailand has an extensive range of radio stations particularly at local level. Most of these are Thai language stations. However there are strong commercial English speaking stations in Bangkok which are also available on the internet. There is a growing list of Thai based internet radio services which are aimed at the ex-pat or visitor to Thailand. (Above) The Bangkok Post's online news website is a very good place to begin a search for information on Thailand's news and social affairs. (Below) There are now a growing range of Thai online commercial radio stations that can be listened to all over the world.